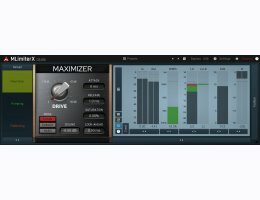 A limiter is an essential tool for every mixing and mastering engineer. If you are looking for the big guns that can make your recordings sound louder while keeping transparency, but add character if you ask for it, MLimiterX is the weapon for you! 4 simple knobs give you all the power to make your recordings loud without the ugly artifacts that most limiters cause. Choose the character you like and just use the drive knob. Advanced visualization will tell you immediately how loud the results are. If you need to dive deeper, just click the Edit button to get to all the controls. MLimiterX features our magnificent saturation system, which can give a pleasant analogue character to your music and even make it louder! If you want to move beyond the easy to use presets or you want to get a little more creative, you will enjoy the more advanced features of MLimiterX - psycho-acoustic pre-filtering, custom attack and release shapes, spectral smoothing plus much more.